Change requires the introduction of stimuli. When Ian suddenly desired change, he introduced weight training, dieting, and re-wrote his lifetime goals. BodySpace members push their physical limits for myriad reasons. Some just want to look good. Others prep for a sport or a modeling opportunity. Some seek fame, fortune and glory. Ian Estabrook works it for a different reason … his health. He gained weight at a fast rate through his teen years. He decided the day after his 16th birthday that the time had come to do something to perpetuate his young life. His entire lifestyle is now based around training and eating healthy. He doesn't do it for his health only now. Despite a full schedule at the University of Illinois, he has already won one bodybuilding contest and placed second at another. He now knows that nothing is impossible and wants to share that message with anyone who will listen. His message, his training, the products he likes and those whom inspire him are all mixed-in to his success. He shares it all with you, as we honor him for being the newest BodySpace Member of the Month! I had always been out of shape for as long as I could remember. My weight started to get out of control in my early teens and brought several health complications with it. By the time I was in high school, I weighed 190 pounds and continued to gain weight at an alarming rate. By the beginning of my sophomore year, my weight reached 260 pounds. My body fat was more than 30%. I was constantly at the hospital getting blood tests; I also had my liver and kidneys examined. Doctors always had bad news. My organs were working twice as hard as an average person's. And if I didn't do something about it, I'd live a much shorter life than I planned. I knew I was obese, but I was addicted to food. On my 16th birthday, a picture of my mom and I put things in perspective. I didn't even recognize the person staring back at me. From that day on, I knew I had to make a change, and not just a small change - I had to change my entire life. I asked my dad if he had anything to help me, and he dug out a copy of Arnold Schwarzenegger's Encyclopedia of Bodybuilding. Armed with some "old school" knowledge, I started the day after my birthday in my basement, using an old Weider power rack, a few dumbbells and a resolve to transform my life. My entire life changed the day I dedicated myself to a healthy lifestyle. My diet, training and supplementation are a core part of who I am. I consume 5-6 meals per day, weight train, do cardio regularly and ensure I take care of all other areas of my life, such as family and college. Honestly, trading my old lifestyle for my new healthy one helped me do more than just lose weight - it helped me mature into the man I am today; I became a more disciplined, driven individual. Bodybuilding literally saved my life and gave me the chance to pursue my passions with a renewed sense of vigor. I always visited Bodybuilding.com as a nutrition, training and supplementation resource. One day, as I was surfing the site, an ad for BodySpace caught my attention. I never really thought about getting a BodySpace before, but after browsing through the most inspirational members' pages, I knew I wanted to join BodySpace's inspiring ranks. 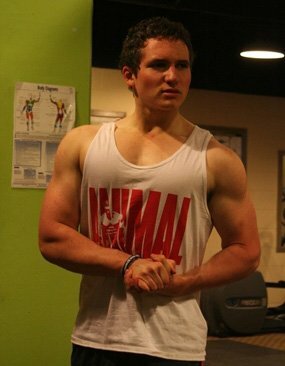 I've used it ever since to help me track progress, blog about my fitness life and connect with people who share similar goals. The best part about BodySpace is its ability to keep people accountable for the goals they set for themselves. Making your goals public is a way to keep one on track. If you don't reach your goals, everyone will see it. While this may sound harsh, it is actually a wonderful system. Public accountability helps people push harder to achieve their goals, and that is exactly how BodySpace helped me. Kris Gethin, Bodybuilding.com's deputy editor, covered making one's goals public in his book, Body by Design. I must have read that chapter five times and let the message soak in. I knew that in order to make the most progress possible, I had to let others know what I was doing. BodySpace's most inspirational members have also been role models and guides for me throughout my journey. Reading about how others make progress, reach their goals and inspire others is one of the most motivating parts of BodySpace. The BodyBlog is definitely my favorite feature on BodySpace. I am an avid writer, so I enjoy blogging and connecting with people via my writing. Additionally, it helps me track my progress, look back on past workouts and gives me a place to let others know how I'm doing both in and out of the gym. Back training! Heavy deadlifting, chin-ups and rows are my favorite exercises to do. While I like to use total body workouts as my primary workout split, I will sometimes take a few weeks out of the year to train each muscle group individually. I don't go crazy when it comes to supplements. I like to try a little of everything, then pick a few core supplements I tend to keep in my nutrition plan for most of the year. My first choice is a high-quality whey protein isolate or blend. I love Combat Powder by MusclePharm. The taste is outstanding; I always look forward to drinking it. In addition, I like Gaspari Nutrition's MyoFusion as well as Optimum Nutrition's Gold Standard Whey Protein. At the moment, I am using Combat Powder and love it. With my protein requirement taken care of, I then spring for a multivitamin. Optimum Nutrition's OptiMen has been my multivitamin of choice for a little more than two years now. My next choice is BCAAs. Scivation's Xtend has been a staple for many years now. I also like USPLabs' Modern BCAA. I also highly recommend fish oil. Any brand of fish oil works well for me. I get 6g per day in three doses throughout the day. Finally, I use a pre-workout energy product. Being a college student, I am always busy with classes, work and other activities. It can get tiring! Pre-workout supplements give me that extra kick after a long day. My top three are MusclePharm's Assault (the original formula is my favorite), Universal's Animal RAGE and Cellucor's C4. I should note that I do not use pre-workout supplements year round. I will only use them when my training becomes particularly heavy or I am feeling sluggish. Becoming a member of BodySpace means becoming a part of something bigger than yourself. I knew that joining BodySpace was a commitment not just to my own goals, but to all other members' goals as well. It is a community of positive peer pressure and success. Having the ability to connect and learn from similar people is a great way to stay on track, learn new things about physical excellence and even about oneself. I have learned the importance of community when it comes to reaching my goals. It's not just a social networking site for the physically fit - it is a family where everyone pushes one another to be their very best. I would like to thank all of those who kept me accountable for my goals. Without you guys and girls, I wouldn't have made my dream of doing bodybuilding shows a reality. I encourage all of you to keep pursuing your goals without restraint; if I can do it, you can do it too. Special thanks go out to Roger Lockridge, Chad Shaw, and Kris Gethin. These men have been huge inspirations to me throughout my entire bodybuilding career. I have read Roger's articles for years and love trying out his workouts. Chad helped me stay motivated and on track when I was preparing for my bodybuilding shows last November; in addition, his physique is phenomenal and gives me something to aspire to as I continue my journey. Finally, Kris' articles and training programs have been valuable assets to me. His transformations are so inspiring and I look up to him as a role model in the natural bodybuilding world. I want to say that nothing is impossible if you put your mind to it. Pick a goal, make a plan and follow through with everything you've got - you never know what awaits you at the finish line.